Back in the mid-nineties i made my first pilgrimage to northern California wine country. It was a whirlwind trip covering hundreds of miles and dozens of wineries in a long weekend. Kunde Estate was a blur as I sped my way to Kenwood and points beyond. And, though I knew they had a good reputation for making solid zin and chard, that first blur was sort of the way I continued to experience their brand for many years - from a distance. 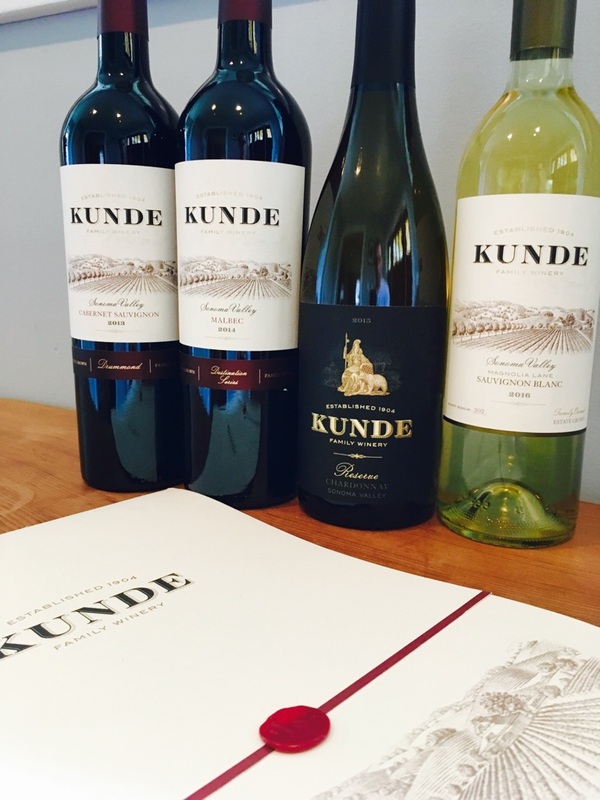 Fast forward several years and Kunde has undergone more than just a facelift. Refocusing on quality over quantify, the family-run winery has replanted, retooled, and rehabilitated everything from vines to trellis systems to winemaking process. The samples that arrived for review offered a terrific chance to revisit this stalwart Sonoma Valley label and see how the changes they've made are paying off. Before we look at each of the wines, a few general observations. First, they've done a great job on packaging - these bottles/labels are quite attractive. Second, there's not a drop out of place in these wines. They are categorically true to both place and variety, resulting in wines that value honest expression over showboating. So, when you read below that the cabernet is "textbook Sonoma Valley cabernet...", that's what that means. Finally, a word on pricing. The wines below come from a mix of their Estate Series (lower priced), Destination Series (mid tier), and Reserve level. I found plenty to like at the more moderate price levels. I look forward to revisiting this winery's lineup soon. Clean, clean, clean. Fresh and fast with classic Northern California sauvignon blanc flavors coming at you in rapidfire sequence, and backed by an invigorating energy that doesn't come across as aggressive. Freshly mowed grass, unripe Granny Smith apple, and a tart citrus kick make for a lively, up-beat companion for porch conversation or even midweight summer fare. A lot to like here. With raised gold lettering on a black label and honeyed hue in the glass, this makes a strong first impression. Aromatics are anything but subtle, offering full, round, custard wafts. But in the mouth it is as much about what's absent as present. It certainly has prominent archetypal California chardonnay characteristics on the fruit side of the balance sheet, as well as evidence of competence in the cellar, but it is (mercifully) lacking overbearing oak, high-octane alcohol, and overhandling which, in the case of this sourcing, would be a crime. Call it success through provenance and restraint - something you don't see too often in these parts. Finishes with a bright, lip smack of acidity that keeps you coming back. Tastes expensive and luxurious. Midnight magenta looming in the glass just threatening that white shirt you're wearing. The clean nose hints at freshness and honesty. Beguiling approachability thanks to bathwater-like supple texture and none of the garrish, often off-putting hard edges that many malbecs punch with. There's a super subtle suggestion of distant smoke that adds attractive mystery on the way to becoming that favorite old sweater that just feels so right. While the varietal characteristics don't run deep in this wine, there's zero turbulence from introduction to infatuation, and it's a trip that passes quickly. Probably my favorite in this quiver. A wine of solid, substantial structure. Beginning to show the earliest signs of having a few years of age on it, but clearly still very early in its arc toward peaking. Lots of high-toned, oak-trimmed fruit, lofty frequency and profound depth of classic cabernet. Made in a textbook Sonoma valley cabernet style. Serious stuff.